Support Darlene Necan – Building home. Building safety. Building sovereignty. Building home. Building safety. Building sovereignty. Treaty #3 Ojibway woman announces a victory! Darlene Necan of the Ojibway Nation of Saugeen #258 is happy to announce a victory in her fight to build her own home on her family’s land in Savant Lake, ON, Treaty #3 area. In October 2013, the Ontario Ministry of Natural Resources and Forestry served Darlene a stop-work order, claiming her land was Crown Land. The MNRF forced Darlene to be homeless and jobless for two winters. In a context of thousands of missing and murdered Indigenous women, the MNRF put Darlene in a position of having to search for shelter each day, hitchhiking from place to place, without any kind of safety or security. After speaking out on the charges and steep fines she faced, the MNRF offered a Land Use Permit. Darlene refused to accept the Land Use Permit because she knew she did not need one for her own land. When Darlene decided to fight in court for the truth, the MNRF decided to drop the charges. Darlene is going home, to finish building her house on her traditional territory. So much is possible when one believes and fights from the heart. Darlene stepped out in faith, ready to take the blows, for the other kokums, for the youth, for the coming faces. A wide movement of grassroots support grew and grew. The existence of and the conclusion to this case shows the threat and power of a good example that Darlene is continuing to set with her mind, body and spirit. Anishnaabe people should not be homeless, paying rent, or stuck in the impossible trap of the welfare system on their own land. Darlene is one of so many Anishnaabe women who remind us all that Mother Earth provides and is the only true source of power and sovereignty. When the land is sold and exploited, a dependency is created on the capitalist system and it is traumatizing and deadly. But Anishnaabe people will continue to step out, claim what is theirs, and nurture self-determination. This is a real victory for grassroots Anishnaabe women standing for the land and future generations. Thank you to all those who fought before, and the supporters today. Darlene expresses her sincere thanks to all those who showed support in so many ways. The fight is far from over. Darlene still has much to build in order to be self-sustaining on her own land, and so many of her people still face homelessness and traumatizing poverty. The grassroots movement of support and solidarity must continue to grow. Check back here for more information soon. Darlene Necan is the spokesperson for off-reserve members of the Ojibway Nation of Saugeen no.258. Darlene has been unable to acquire housing in that community, about 400 kilometres northwest of Thunder Bay, since the reserve was created in the late 1990s. For about a decade, Darlene has been struggling for housing for off-reserve members. 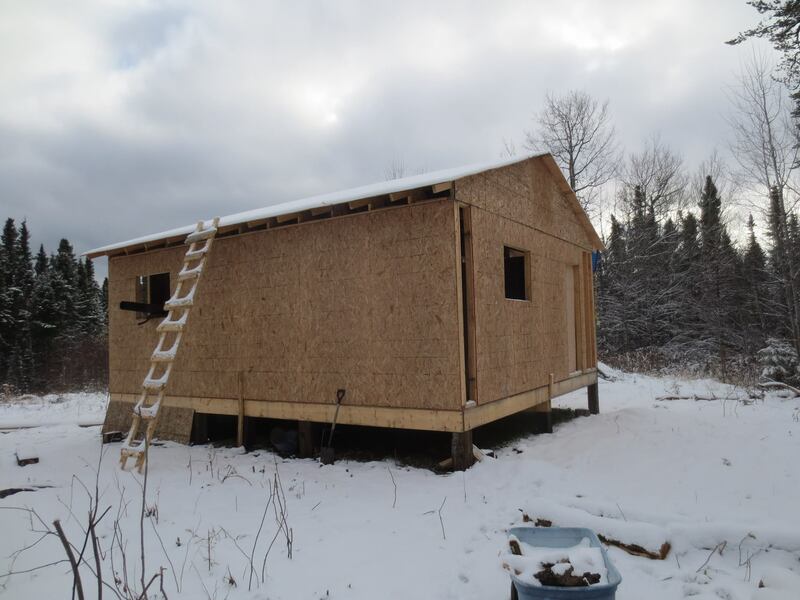 Last year, Darlene Necan began building her own plywood home, with donated materials, where her family home once stood, 20 km south of the reserve. The Ministry of Natural Resources and Forestry has charged Necan with breaches of the Public Lands Act that carry fines of up to $10,000, and up to an additional $1,000 fine each time she is caught continuing to build. Indigenous women continue to go missing and be murdered while Darlene faces charges and steep fines for taking the kind of grassroots action that communities need. Please check this page over the next few days for more information. Here are the media related to Darlene’s struggle in rough chronological order.